The main difference between pluripotent and multipotent stem cells is that the pluripotent stem cells can differentiate into any type of cells of the body whereas the multipotent stem cells only have the ability to differentiate into several types of cells. Pluripotent and multipotent stem cells are two types of stem cells that occur through the developmental stages of life. Moreover, embryonic stem cells are pluripotent stem cells while hematopoietic stem cells are multipotent stem cells. Pluripotent stem cells are the stem cells that can differentiate into any type of cells in the body. That means; they can differentiate into any type of cells in the three germ layers: endoderm, mesoderm, and ectoderm. Here, the endoderm develops the lungs, interior stomach lining, and the gastrointestinal tract. The mesoderm develops the bone, muscle, blood, and the urogenital. On the other hand, the ectoderm develops the nervous system and the epidermal tissue. Embryonic stem cells – The inner cell mass of the blastocyst contains embryonic stem cells. It develops after the 5th day of fertilization. It derives from the totipotent cells of the zygote underwent cleavage. These cells, in addition to the inner cell mass, form the trophoblast, which develops the placenta. Umbilical cord stem cells/perinatal stem cells – They originate from the umbilical cord blood and can be used to treat complicated diseases of the individual in his later life due to their ability to differentiate into any type of cells of the body. Induced pluripotent stem cells (iPSCs) – They are reprogrammed artificially to behave like embryonic stem cells. Here, the somatic cells of the same individual are used to produce the stem cells. Multipotent stem cells are the stem cells that can differentiate into several, functionally-related cell types of the body. They have the ability to self-renew and differentiate into specialized cell types. Also, the main function of the multipotent stem cells is to replenish the damaged or dead cells of the tissue where the stem cells occur. Therefore, this type of stem cells remains quiescent until they get the signal to differentiate. 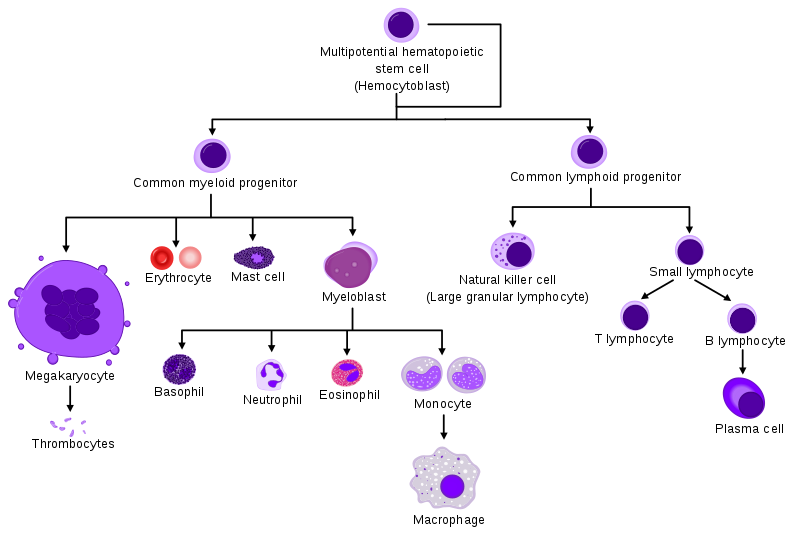 The three main types of multipotent stem cells are hematopoietic stem cells, neural stem cells, and mesenchymal stem cells. Pluripotent and multipotent stem cells are two types of stem cells which occur in the body. They both have an unlimited self-renewing ability. Since they are undifferentiated cells, they do not perform a specialized function in the body. Also, both their differentiation produces specialized cells. Moreover, both types of stem cells help in stem cell transplantation. Pluripotent stem cells are the stem cells that can differentiate into any type of cells in the body whereas multipotent stem cells are the stem cells that can differentiate into several types of cells in the body. Thus, this gives an idea about the difference between pluripotent and multipotent stem cells. To be more specific, the pluripotent stem cells can differentiate into any type of cells in the three germ layers while multipotent stem cells can differentiate into several functionally-related cell types in the body. Also, potency is a major difference between pluripotent and multipotent stem cells. Pluripotent stem cells have a medium potency while multipotent stem cells have a low potency. 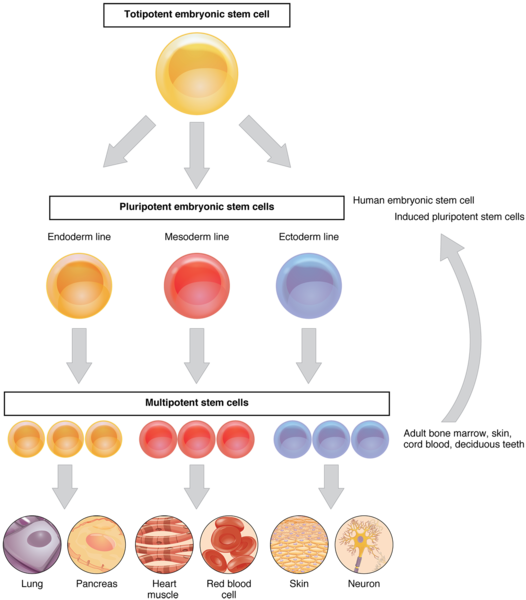 Natural pluripotent stem cells have an embryonic origin while multipotent stem cells have an adult origin. Hence, this is another important difference between pluripotent and multipotent stem cells. We can identify a difference between pluripotent and multipotent stem cells based on their activeness too. Pluripotent stem cells are actively dividing and differentiating to produce the next cell generations while multipotent stem cells remain quiescent until they get the signals to differentiate. Moreover, pluripotent stem cells occur in the inner cell mass of the blastocyst while multipotent stem cells occur in many tissues. Expression of pluripotency genes is another difference between pluripotent and multipotent stem cells. The expression of pluripotency genes is high in the pluripotent stem cells while the expression of pluripotency genes is comparatively low in the multipotent stem cells. Furthermore, the expression of lineage-specific genes in low in the pluripotent stem cells while the expression of lineage-specific genes is high in the multipotent stem cells. Besides, the two main advantages of pluripotent stem cells transplantation are their unlimited self-renewal ability and easiness to isolate. However, in multipotent stem cell transplantation, there is a less chance of tissue rejection, as well as less ethical issues. Finally, the high risk of tissue rejection, ethical issues, and teratoma formation are the disadvantages of the pluripotent stem cell transplantation while limited differentiation and difficulties in isolation are the disadvantages of multipotent stem cell transplantation. Embryonic stem cells, umbilical cord stem cells, and induced pluripotent stem cells are the types of pluripotent stem cells while hematopoietic stem cells, neural stem cells, and mesenchymal stem cells are multipotent stem cells. In conclusion, pluripotent stem cells are mainly the embryonic stem cells, which can differentiate into any type of cells of the three germ layers that make up the body. Therefore, they have a high potency. On the other hand, multipotent stem cells are mainly the adult stem cells, which can differentiate into several types of functionally-related cells of a particular tissue. Hence, they have a less potency than the pluripotent stem cells. Thus, the main difference between pluripotent and multipotent stem cells is the degree of potency.